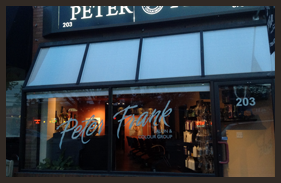 Here at Peter Frank our team consists of 20 highly trained artists in all phases of beauty. "Passion" is at the heart of everything we do. We love what we do and it shows! The color department uses Goldwell and was also newly certified to use Paul Mitchell Color. Our staff attends quarterly education so they always on the cutting edge of the newest trends. We are a full service hair salon.